A grilled cheese sandwich with a twist. 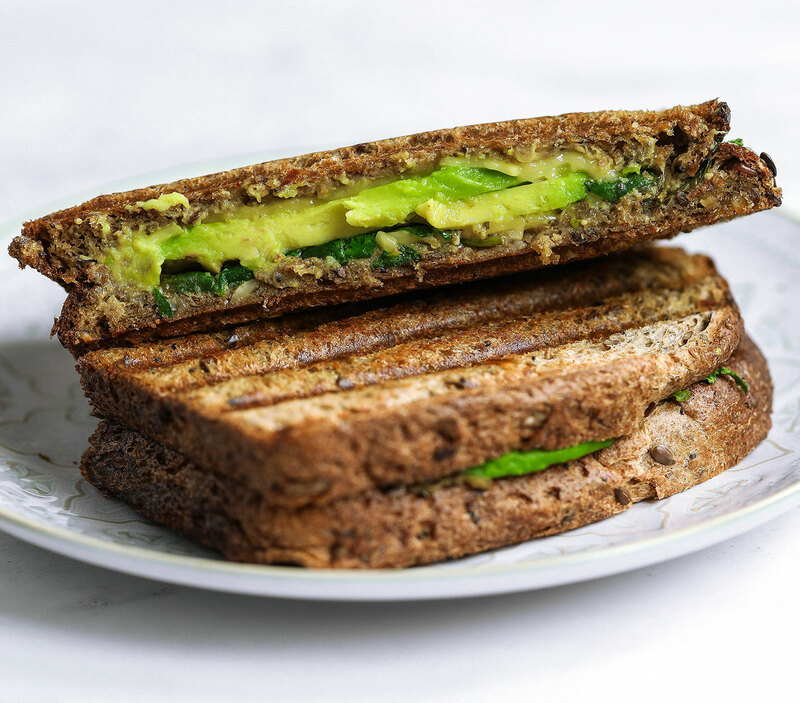 The twist being this vegan avocado pesto grilled cheese toastie is SO MUCH BETTER than a plain cheese toastie. 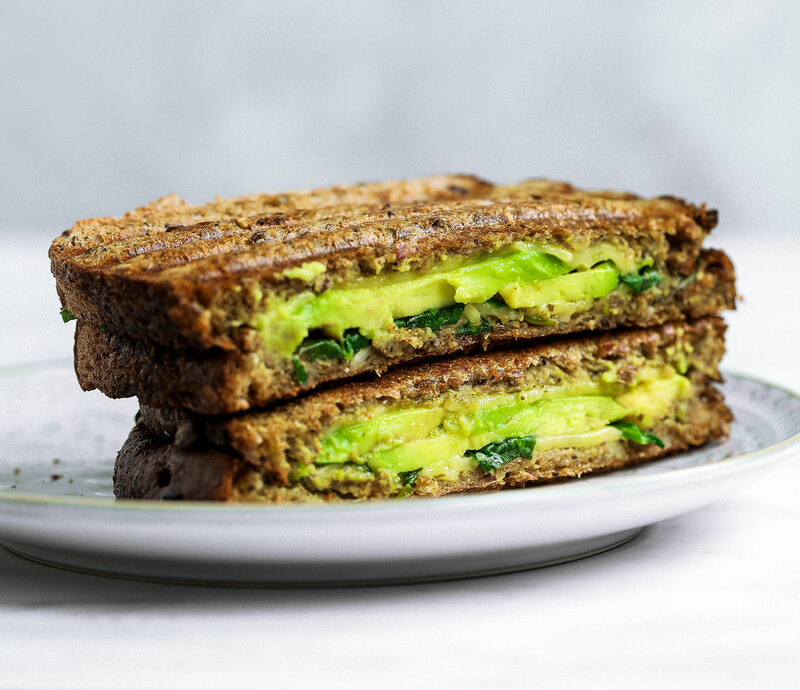 Add avocado to any sandwich and instantly it’s ten times better! Especially when paired with pesto and cheese. Since reducing my dairy intake, I haven’t really missed cheese all that much. The one thing I hear most from people who cut out dairy from their diet or go vegan is how much they miss cheese. 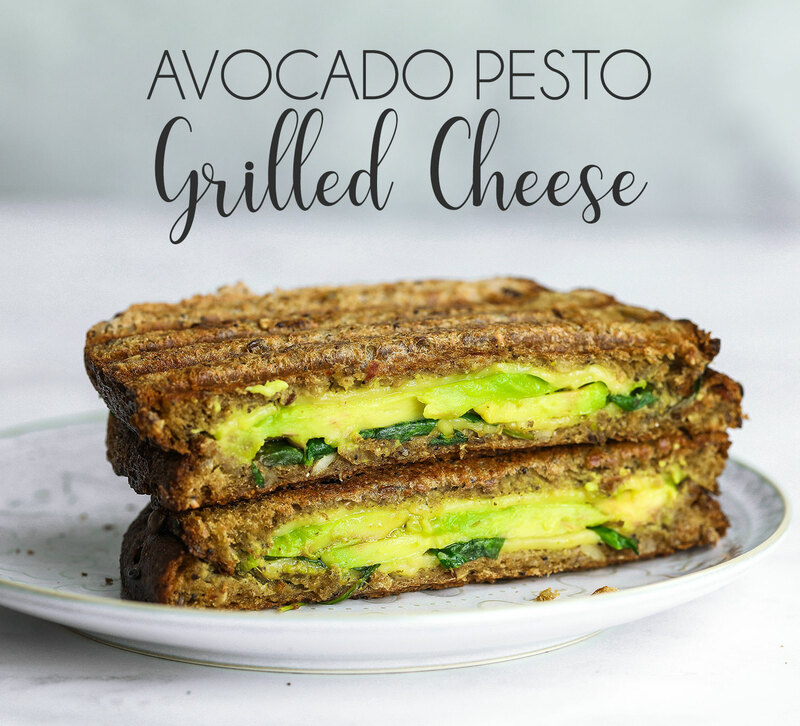 I’ve never experienced that; however, I do crave a bit of cheese every now and then and this vegan avocado pesto grilled cheese is the ultimate way to satisfy such a craving. As I mentioned in my previous post, during my uni days I relied quite heavenly on sandwiches during stressful revision periods. Now that I’m a student again, I unfortunately don’t have the luxury of spending my days and nights focusing solely on my studies without worrying about things like doing the laundry, food shopping, cleaning the house, washing the dishes on top of trying to run and grow a business. When I was at uni, my mum took charge of everything bless her. Adult life has really given me perspective and made me realise how I used to take uni days and that freedom (and my mum!) for granted. This time around I have just as many exams and assignments as well as clinic work (which is so intense!) and so much less free time to do it all in! Now more than ever I need to rely on quick, easy and yummy meals that will keep me going without leaving a ton of pans and plates to wash up afterwards. 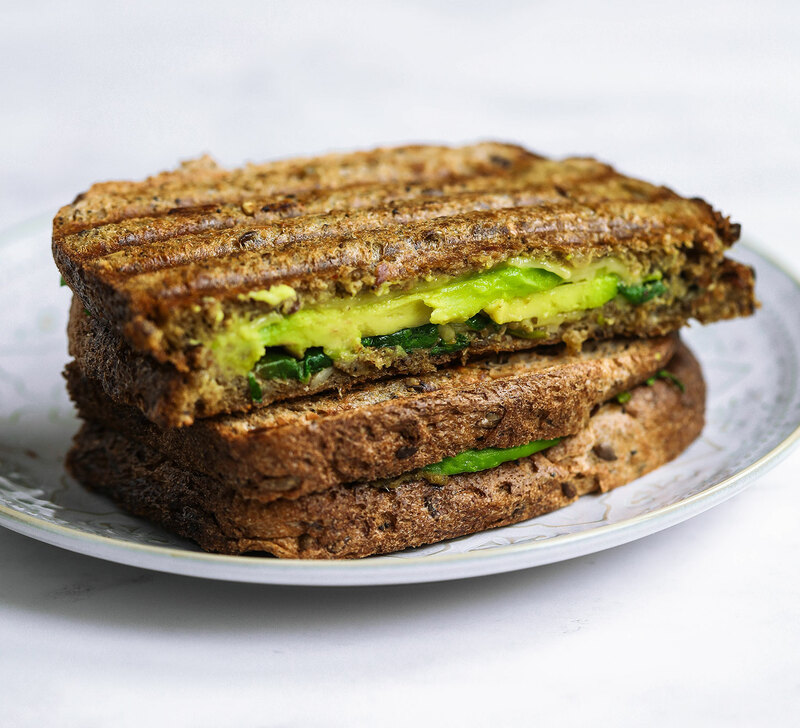 I find myself turning to this avocado pesto grilled cheese sandwich a lot recently. And the husband isn’t complaining either. He loves grilled cheese toasties. He loves sandwiches and toasties full stop. Actually anything with bread you can guarantee he’s a fan of. If you want to take your sandwiches to the next level, you NEED to start grilling them. Honestly it’s a game changer! 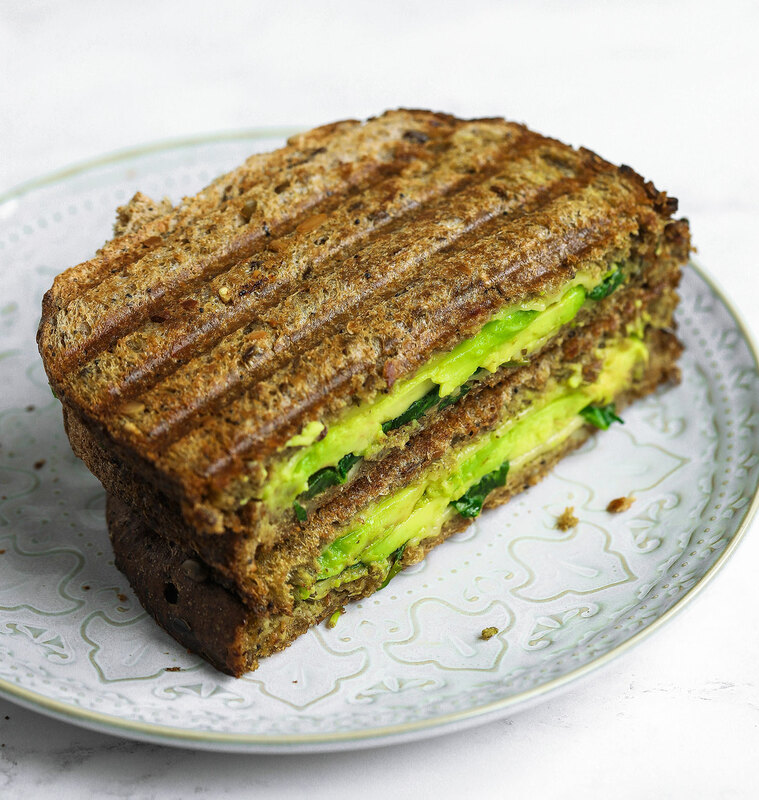 Just by brushing your sandwich with a bit of butter on each side and pressing it in a hot grill for 3-4 minutes makes the biggest difference in your sandwich eating experience! Once you try it you can never go back. I find sandwiches a lot more boring now if I don’t toast them. Trust me, you need to give it a try! The first feature that stood out when I received the grill was the DuraCeramic plates that you can remove and wash separately, which is so handy. I’ve always found grills so awkward to clean, which then puts me off from using them in the first place. I think this is such a clever idea and makes the whole experience so much smoother and more enjoyable. The plates are also dishwasher safe making the cleaning process even easier! Another feature of the grill is that it has a floating hinge that allows for 180 degree opening to cook food with different thicknesses and it also means you can cook more on it at the same time. As well as toasties, it’s perfect for grilling quesadilla, French toast, meat, tofu, sausages, burgers, vegetables, onions and even caramelising fruit like banana (yum!). Brush each slice of toast with a little bit of melted butter, then spread the pesto on the other side. Add a slice of cheese on top of the pesto, then arrange the avocado slices and top with a few spinach leaves. Add another slice of cheese and top with the other bread, pesto side down. Heat your grill on medium/high. Once hot, place the sandwich in the middle of the grill and use the handle to press the top plate down. Leave to cook for 3-4 minutes, but check it after 2 minutes. You want to cook it until it’s golden brown. Wait for it to cool down a little, then enjoy! Thanks to Breville for sponsoring this post. Commissioned posts is how I’m able to continue working on the blog and creating recipes and recipe videos for you. As always, all opinions are my own. But butter isn’t vegan? I’m confused. Hi Nadia, this looks amazing! What are your favorite brands of vegan cheese to use?